Two graduates of Western Military Academy in Alton died as heroes on the battlefields of the Korean War and another graduate was awarded the Silver Star in the war. Capt. Herman Roesch died leading his soldiers against Chinese Communist troops and Lt. Bob McIntyre was killed in a fierce battle on Korea's front line. Lt. Tom Black was seriously wounded in leading a brave attack against the enemy in Korea. Roesch was an outstanding cadet who graduated in 1929 from Western Military in Alton, McIntyre was in the 1947 graduating class and Black was valedictorian of the 1948 class. The three soldiers are listed on a long honor roll of military heroes who graduated from Western Military in Alton, said C.B. Jackson, a Western historian who graduated from the academy in 1968. Western was founded by Albert M. Jackson on Seminary Avenue in Upper Alton in 1879 and graduated hundreds of outstanding military leaders until it closed in 1971. Roesch's military skill on the battlefield of Korea was learned early as a cadet at Western Military in the 1920s. He played on the football team and marched in his dress uniform with other cadets in parades through Upper Alton. He graduated from Western in 1929 and entered the Army, where his excellence in military strategy won him a promotion to captain. When North Korean Communist troops invaded South Korea in 1950, Roesch was sent as a command adviser to the fighting 7th Regiment of South Korean forces. On Oct. 25, 1950, Roesch and the 7th Regiment were ordered to move quickly to the city of Chosan on the Yalu River, where U.S. and enemy forces were in a fierce battle. Roesch's troops were attacked and many soldiers died in the battle, said Lt. Col. Harry Fleming, the U.S. commander. Roesch and five U.S. soldiers bravely repelled repeated attacks of Communist soldiers, Fleming said. Finally, 300 enemy soldiers armed with machine guns, artillery and mortars attacked and killed Roesch and the four American soldiers, said Fleming, who was captured by the enemy. Roesch was first reported missing in action in 1950, but his death was confirmed in 1953 when Fleming was released from a prisoner of war camp. "Capt. Roesch died resisting overwhelming numbers of the enemy to the very last," Fleming said in a letter to Roesch's family. "I am recommending him for the posthumous award of the Distinguished Service Cross." When Roesch was killed in action, his son, Robert Hermann Roesch, was a cadet at Western Military Academy in Alton. Roesch was one of 65 Western Military cadets who died in World War I, World War II and Korea, Jackson, the Western historian, said. Roesch's name is in the annals of U.S. military history with Western graduates such as famed fighter pilot Edward "Butch" O'Hare, Capt. Howard Humphreys and Col. Paul Tibbets, who piloted the plane that dropped the atomic bomb on Japan. Western graduates remember cadet Bob McIntyre, who graduated from the Alton academy in 1947 and died as a brave young officer leading his troops on the battlefields of Korea in 1953. McIntyre came from Quincy, Ill., and enrolled at Western, where he was an outstanding student in the classroom, learning the skills of military strategy. "He was a friendly student of excellent character and well-liked by the students and faculty," said the editor of the "Shrapnel," the Western newspaper. McIntyre was a star of the Western swimming team, sang in the glee club and showed his artistic skill as a newspaper cartoonist. After graduating from Western, he was commissioned as a lieutenant at the U.S. Military Academy at West Point, N.Y.
McIntyre arrived on the Korean war battlefield in Christmas 1952 as commander of the 3rd Platoon, Company B, 179th Infantry Regiment. He was killed leading his soldiers in a brave attack against heavily armed enemy troops. McIntyre's mother was at home reading one of his letters sent from Korea when a telegram arrived with the news that her son had died in the war. Tom Black was a third cadet from Western Military in Alton to lead U.S. infantry troops in the Korean War. Black enrolled at Western in the 1940s and was one of the outstanding cadets on the academic honor roll in the history of the academy. He was selected as a cadet captain and earned recognition for his ability in classes in military planning and leadership. He showed his talent on the athletic field as a star in football, basketball and baseball. Black graduated as valedictorian of his 1948 class at Western and went to college at UCLA. He was commissioned as an officer in an elite paratrooper unit at Fort Benning, Ga. He went to Korea as a leader of infantry soldiers with the 9th Infantry Regiment. Black was awarded the Bronze Star and Silver Star for his bravery in leading his troops into battle. He was seriously wounded when metal shrapnel from an enemy artillery shell penetrated his flak vest and struck his arms and face. He was awarded the Purple Heart for his wounds and came home from the war to start a successful law practice in California. 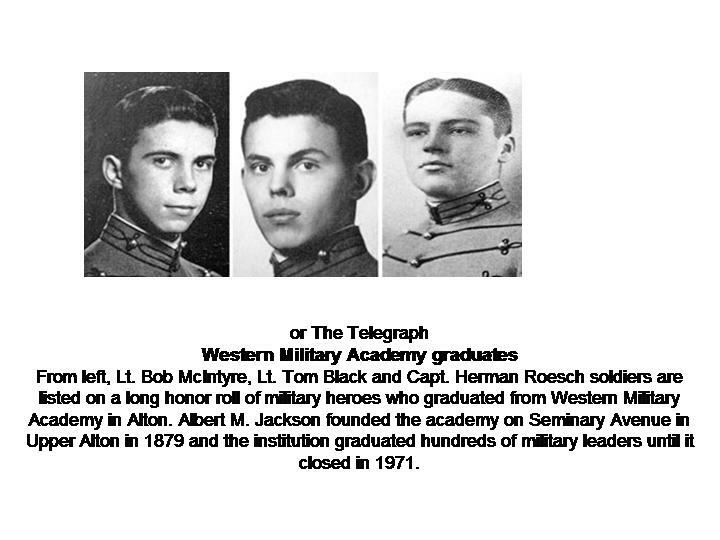 The heroic exploits of Roesch, McIntyre and Black in the Korean War are recorded in the history of Western Military Academy in Alton.